This beautiful applique quilt design is based on floral embroidery designs from the early 1930s. 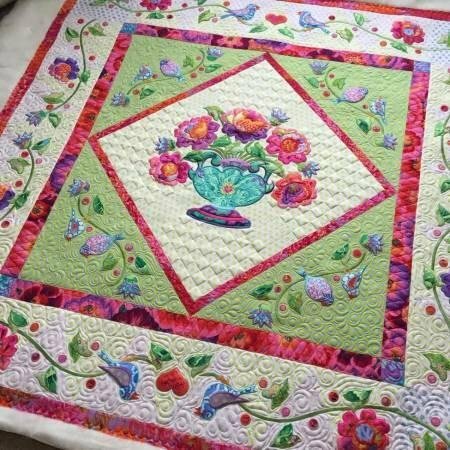 The name, Rosalita, is the Spanish version of the name Rosa, which is also the Latin word for the genus of the rose plant, the flowers used in this quilt. The finished quilt is for embroidery machine applique and is 59" square. Machine embroidery designs come in the following formats: art., .art60, .dst, .exp, .hus, .jef, .pes, .vip, .vp3. Fits hoops that are least: 300 x 200 (11.8" x 7.8"), or 400 x 150 (15.7" x 5.8"). SVG files also included.